Visit the Minnesota Zoo’s Tropics Trail around opening time (or just walk by), and you’ll be amazed when you discover that the whooping song vibrating through the entire building is from two white-cheeked gibbons, each weighing less than 20 pounds!Learn more information about gibbon. Please sponsor the gibbon by making your gift to the Minnesota Zoo Foundation today. Your tax-deductible gift will help provide quality care for all of the amazing animals at the Minnesota Zoo. 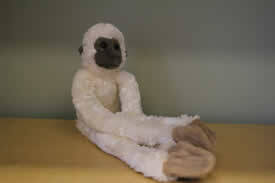 A 17” gibbon hanging plush toy. A gibbon trading card with a photo and fun facts.